The nuclear-powered warship completed her shakedown training and, on 2 January 1968, got underway for the western Pacific. She made an overnight stop at Pearl Harbor on the 7th and 8th and arrived in Sasebo, Japan, on the 19th. Five days later, Truxtun and Enterprise (CVAN-65) departed Sasebo and headed for the Sea of Japan in response to North Korea's seizure of American environmental research ship Pueblo (AGEB-2). She operated in the Sea of Japan until 16 February when she headed south for her first line period off the coast of Vietnam. 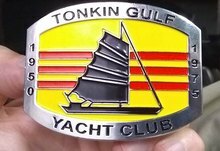 After a brief overnight stop in Subic Bay on the 19th and 20th, the guided missile frigate set a course for "Yankee Station" in the Gulf of Tonkin. 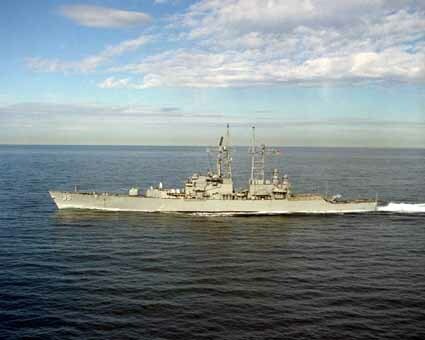 Truxtun spent the majority of the remainder of her deployment in the Far East operating off the coast of Vietnam. While in the combat zone, she conducted search and rescue (SAR) missions, stood guard against North Vietnamese air attacks as a positive identification radar zone (PIRAZ) picket ship, and served as plane-guard ship for carriers Enterprise, Bon Homme Richard (CVA-31), and Ticonderoga (CVS-14). Truxtun punctuated her line periods with calls at Singapore, Hong Kong, Danang, and Subic Bay. She departed Subic Bay on 6 July, steamed east toward the United States, and reentered Long Beach on the 19th. For the next four months, the warship operated along the west coast. She acted as plane guard for Ranger (CVA-61), Kitty Hawk (CVA-63), Enterprise, and Yorktown (CVS-10) while those carriers conducted landing qualifications for pilots. In mid-November, Truxtun became an antisubmarine warfare school ship and trained student sailors in the techniques of hunting submarines. Early in December, the guided missile frigate returned to Long Beach to prepare for overhaul. In January 1969, she shifted to Bremerton, Wash., where she entered the Puget Sound Naval Shipyard for refurbishing which lasted until April. The ship then resumed operations along the west coast which continued until 23 September when she got underway for her second deployment with the 7th Fleet. After a stop at Pearl Harbor, the guided missile frigate arrived at Subic Bay on 20 October. Again, she spent much of her deployment cruising along the coast of embattled Vietnam, taking time periodically to make port calls at Hong Kong, Singapore, and Subic Bay. However, in addition to acting as plane guard for carriers and standing duty as PIRAZ and SAR ship, she also served as a peacetime aerial reconnaissance protective (PAPRO) picket in the Sea of Japan and participated in the Taiwan Strait patrol. Just before departing the Far East, she conducted exercises in the vicinity of Okinawa and then made her final port visit at Sasebo, Japan, from 6 to 11 March 1970. Truxtun returned to Long Beach on 23 March and launched into a round of inspections and training cruises. In June, the warship embarked 40 NROTC midshipmen for their summer training cruise. During the first part of the cruise, she fired missiles on the Pacific missile range and visited San Francisco and Seattle. On 13 July, she departed Seattle for Pearl Harbor to conduct the second part of the training cruise. On 29 July, Truxtun returned to Long Beach from Hawaii, disembarked the midshipmen, and resumed normal operations. For the remainder of the summer, she conducted exercises and underwent various inspections. From 16 to 25 October, she moored alongside Gompers (AD-37) for a tender availability. Following one more period of exercises at sea late in October, she entered the Long Beach Naval Shipyard in preparation for a three-month restricted availability which began on 2 November 1970. Truxtun's yard work was completed in mid-January, and the frigate then conducted type training and ASW exercises before preparing to deploy to the western Pacific once more. She returned to Long Beach on 22 January 1971 and remained there until 2 February when she got underway for Pearl Harbor. After a two-day layover in Hawaii, she resumed her voyage to the Far East on 9 February and reached Subic Bay on the 20th. During that deployment, Truxtun returned to her familiar routine along the coast of Vietnam, standing PIRAZ picket duty and conducting exercises and tests. She visited Yokosuka, Japan, several times and made single stops at Hong Kong and Sattahip, Thailand. In late April, she also patrolled the Taiwan Strait for two days. On 6 July, she completed her final line period of the deployment and left the Gulf of Tonkin. After a visit to Subic Bay, she set a course, on the 10th, for Fre-mantle, Australia, where she spent a week at the end of July. Following port calls at Pago Pago, Samoa, and Pearl Harbor, she moored at Long Beach on 17 August and began post-deployment standdown. Through the end of September, Truxtun received visitors on board and conducted drills to improve and to test her missile and gunnery marksmanship. During the first week in October, a Board of Inspection and Survey inspected Truxtun; and, on the 8th, she began a restricted availability during which she was modified to utilize the Light Airborne Multi-purpose System (LAMPS). From 18 November to 9 December, she conducted post-availability dock trials and type training as well as testing the newly installed LAMPS system. On 14 December 1971, a team from Naval Air Systems Command inspected and certified Truxtun's LAMPS installation. On 13 July, she departed Long Beach with HMNZS Canterbury, bound for the western Pacific and for her most eventful series of line periods off Vietnam. She parted company from Canterbury on 18 July and put into Pearl Harbor the following day. On the 23d, Truxtun resumed her voyage to the Orient and moored at Subic Bay on 4 August. Four days later, she loaded ammunition and got underway for her first line period in the Gulf of Tonkin. Over the next five months, the guided missile frigate stood both SAR and PIRAZ picket duty. During these assignments, she evaded at least three typhoons. Her busiest week came between 8 and 15 October, when her radarmen vectored the combat air patrol to six MiG kills, three of which occurred on the 15th alone. By the end of her deployment, she had teamed up with the combat air patrol to down five more, bringing her victory tally to 11 MiG's. In October, November, and January, Truxtun briefly joined the Taiwan Strait patrol. She also made port calls at Sasebo, Singapore, Hong Kong, and Yokosuka. On 21 January 1973, Reeves (DLG-24) relieved her on the north SAR station, and Truxtun headed, via the Taiwan Strait, for Japan. She stopped at Yokosuka from 26 to 30 January before continuing on, via Pearl Harbor, to Long Beach, where she arrived on Lincoln's Birthday. Post-deployment standdown took up the ensuing month. On 19 March, she moored alongside Piedmont (AD-15) and commenced a tender availability which lasted until late April. Truxtun then resumed operations in and out of Long Beach. In May, she conducted type training off the California coast and naval gunfire support qualifications at San Clemente Island. On 7 June, the warship began embarking Naval Academy and NROTC midshipmen for their summer cruise. For the next two months, she trained the midshipmen, carrying them to ports along the west coast as well as to Hawaii. She debarked the midshipmen on 27 July and began preparations for her fifth deployment to the Far East. On 17 August, Truxtun got underway from Long Beach, bound for the western Pacific. En route, she stopped at Pearl Harbor and reached Subic Bay on 5 September. She punctuated relatively uneventful tours of duty on PIRAZ station in the Gulf of Tonkin with port visits to Sattahip, Singapore, Manila, and Yokosuka. Truxtun also conducted missile exercises and ASW drills. On 9 December, she stood out of Subic Bay, sifted through the San Bernardino Strait, and headed for home. On Christmas Eve 1973, the guided missile frigate moored at Long Beach and began preparations for her first complex overhaul. On 25 January 1974, Truxtun cleared Long Beach for Bremerton, Wash. Four days later, she entered the Puget Sound Naval Shipyard. There, the warship began a major 18-month overhaul during which her nuclear reactors were "refueled." On 30 June 1975, near the end of that repair period, Truxtun was reclassifled a nuclear-powered guided missile cruiser and was redesig-nated CGN-35. On 31 July, she completed the overhaul and all attendant tests and trials and sailed for San Diego. She arrived in her new home port on 4 August and resumed normal operations in the southern California area. That schedule occupied her for the following 12 months.